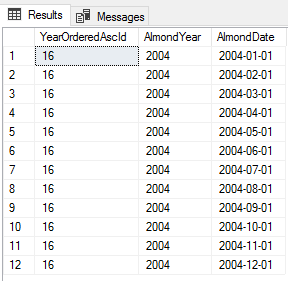 The data set in these examples I use queries 362 values of a date range between December 1988 to January 2019 of almond values measured by a unit of output. The “AlmondValue” is not important to this tip, while the dates are for the examples. Any monthly stored values will work for these exercises with table name and column name substitutions. For readers who may want to copy queries directly, I’ve provided the below loop which will create these values for you to run these examples – the AlmondValue and Base10AlmondValue will differ in the output when you run these query examples, but the logical design of each query in the examples won’t. Your result after running the above loop – remember that the AlmondValue in your table will differ since these are randomly generated. The basic part of a common table expression is that we can wrap a query and run CRUD operations with the wrapped query. Let’s look at a simple example of wrapping a query and changing column names, then selecting from these new columns. In the below image, we’ll see the highlighted CTE in SQL Server, even though we ran the full query and this shows a quick debugging option that we have – we can select the wrapped query to do a quick check before running the query and this is very useful with CRUD operations that require validation, or where we may be trying to debug a transaction and need to run the first part of a statement that our CRUD operation will run again. This is an important part a CTE in SQL Server: what we see in the wrapped query is what our operation is applied against; in this case, a select statement. We’ve highlighted the inner part of the CTE query, which we could execute. In this case, it would generate the same output. Your AlmondValue and Base10AlmondValue will differ. The common table expression expects each column to be named and the name must also be unique. This is a derived column, meaning that it comes from the values within another column, but as we see, a name is required. We can alternatively create the names explicitly and ignore naming the columns in the wrapped query and the explicit names will override any column name in the query – though I prefer to name in the wrapped query for faster troubleshooting purposes. Notice what happens to the explicit name of Base10 versus Base10AlmondValue. Explicit naming is another approach we can use with CTEs.. Your AlmondValue and Base10AlmondValue will differ. We see the Base10 in the output, so if we have a mixture of explicit column names that differ from the column names within the wrapped query, we should remember to use the explicit column names in references. Another technique we can use with common table expressions is creating multiple CTEs together, similar to creating multiple subqueries that reference other subqueries (a common query output from Entity Framework). Although we can do this, this does not mean these are the most optimal solution, relative to what we’re trying to query. In the below query, we use a combination of these to query our data like we’ve queried above this, and in the second CTE, we look at the average of the AlmondValue for the year. From there, we join the GroupAlmondDates with GetAverageByYear on the AlmondYear and compare the AlmondValue with the average of the year. Our join here allows us to avoid creating another independent common table expression and save to a table, or use a temp table through creating a table, saving data, then removing it later. Our ValueDiff column comes from two CTEs joined. Your ValueDiff will differ. This can be a useful technique provided that we consider we can’t troubleshoot the GetAverageByYear in the way that we can with GroupAlmondDates – meaning that we can’t highlight the wrapped query in the second CTE since it requires the first to exist. Should we use combinations? Sometimes, provided that debugging is either not required (intuitive design) or it’s the only option we have that performs the best. In our next few queries, we’ll apply two SQL Server functions – ROW_NUMBER() and DENSE_RANK() – to view how we can extend analysis in our select statement. Both of these functions involve ordering data, one which orders rows of data by the row number of the data demarcated with the order by clause and the other which ranks data delineated with the order by clause. In the below code, I order five date combinations using descending and ascending with some of these – the row number of the date, the row number of the date specified by the year of the date, and the rank of the year. We can compare the date and years with the output of the five ordered columns. The median value for the first 37 values. Your AlmondValue and Base10AlmondValue will differ. Using the order of our years from the previous query, we could get the average almond value of the median year from our years. In the below query, we filter out the 1988 date and get the median of the other 31 values, seeing that the year 2004 returns. The median year is 2004, from here we could run the average and get the average of this year. I’ve left the average value commented out so that we see the data set that we would be running our average value. We can use this same logic for other aggregates where we may want an aggregate for a specific year based out of the data set, like median is the middle of a data set. As we see, common table expressions (CTE in SQL Server) can provide us with a convenient way to query data similar to using tools like temp tables and subqueries. We have quick troubleshooting options with these where we can run select statements inside the wrapping of the CTE and we can create multiple statements to join together. Are these faster? In some cases, they may be, or they may be faster to troubleshoot – which could be important. Still, we should always test our queries to ensure that the way we’re running our query is the most optimal route.